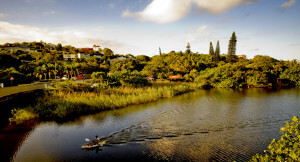 Today Ramsgate is seen as a quaint, artistic holiday village on the KZN South Coast with its idyllic scenery and unhurried way of life a great attraction to artists and those looking to escape the hustle and bustle of city life. The history of Ramsgate shows that this has always been the case. One of the earliest recorded arrivals in the town is recorded in 1895. Captain Crompton arrived on the shore and established a settlement called Fascadale just slightly inland from the coast. He started a trading store and post office on Fascadale Road (which remains today). The settlement was called Fascadale after a ship that wrecked just off the coast at Southbroom in that same year. The ship was carrying sugar from Lisbon to Mauritius. Much of the cargo was rescued by an early settler, Mr Mitchell who is said to have used some of the wood salvaged from the ship in the construction of his home on the Bushy Vales farm not much further inland. Perhaps the most famous early settler was a man called Paul Buck who settled on the Southern Bank of the iBilanhlolo River (on the opposite bank to the Waffle House). The iBilanhlolo River (the marvellous Boiler) got its name from the powerful currents that tun through it and churn up the water creating bubbles. Buck has been described as romantic character who spent his time writing, painting, rearing tropical fish and making violins. He was the first person to christen the river “The Blue Lagoon”. Greetings, Can you tell me if John Gaze and his wife Doreen are still the Owners and Managers of the Waffel House. The history quoted above is correct but the Tea House of the Blue Lagoon as it then was known was not part of the Ramsgate Health Committee and only when these two towns were amalageted with the then Baven-on-Sea Town Board in the late fifties. Although Baven-on-Sea Town Board was the larger area of the two and the new Town should have been named Baven-on-Sea Town Board the Board decided rather that the name be Ramsgate Town Board. Do not know where the Municipal Offices are now but then they were on the corner of Main Road and Fascadale Road next to Spillers Fish Factory.Thought this might be of interest to you. Why I say this I was employed by the Baven-on-Sea Town Board as an Official in December 1955 and later after the two Towns had been joined together I was later appointed their Town Clerk. 7 Abbey Road, Somerset West, City of Cape Town. Western Cape.